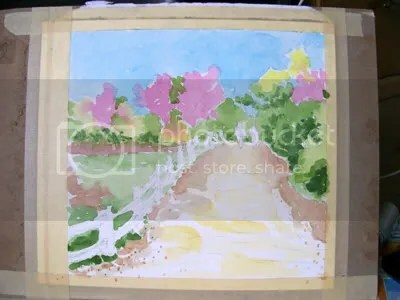 Let’s Paint a Spring Trail! – Let's Paint Nature! 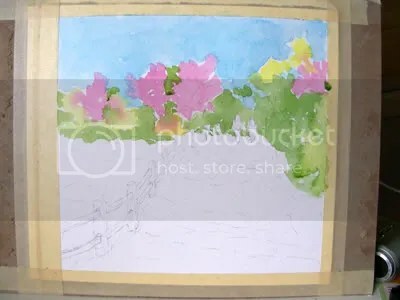 This is going to be a step-by-step demonstration on how to do a watercolor sketch. Here is my reference photo. What a beautiful spring day we have here, after a very long winter it is eagerly welcomed. 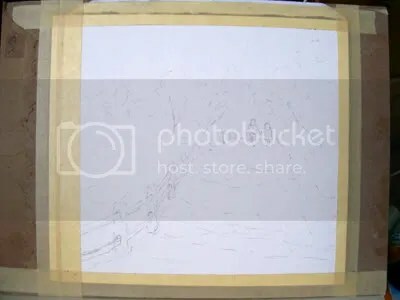 Step 1: I taped my cold press watercolor paper down and made a drawing with a #2 pencil. Step 2: I always like to start at the top and work my way down. For the sky, I used manganese blue. For the purple trees I used permanent rose and a yellow-green for highlights on the green trees. They started to mix and melt together and I don’t care. I really like this actually because when you look into the far distance colors do blend together! This is an example of being “loose” with your sketch. Step 3: Next, while everything was still wet I painted some green trees with sap green watercolor paint. Step 4: When things start to dry paint more trees with sap and the field. There were a few patches of a red/brown color in the field, I used country brick and just made splotches. Remember, this is just a sketch…I’m not looking to be exact. Step 5: For the trail, paint the inside with Naples yellow, but paint the outside of the trail burnt sienna. Leave a lot of white space to represent bright light and leave a little breathing room. 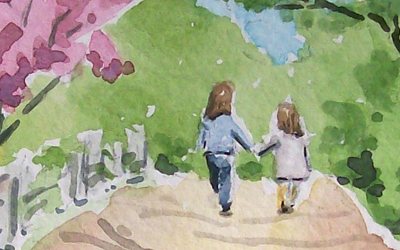 When a watercolor painting has no white space, it feels “heavy” and dull. Step 6: In this step paint the fence with a mixture of raw umber and indigo blue. The lightest part should face the sun, a more concentrated mixture with less water can be painted for the shadows. I also used raw umber for the trees and twigs in the mid-ground of the painting. This is a close up of the two little girls that were on the trail. I am guessing they were sisters. The taller one grabbed the hand of the smaller one and made sure she hung on tight. It was very cute. I used a very small rigger brush for the figures. In my original reference photo, the girls had blond hair, but with the amount of yellow I already painted in my sketch I felt brunettes would be better. Remember you are the artist, you have an artistic license and you can make changes if you like. Step 7 Final: Here is the final piece. 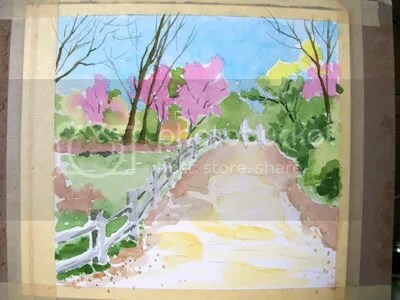 I added darker shades to the purple trees and green trees by adding a little indigo blue to my original paint colors. 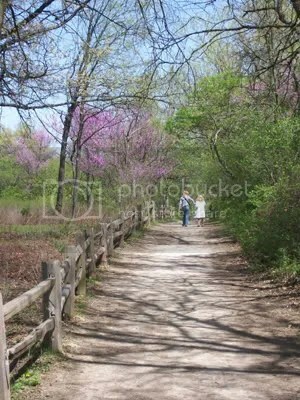 This day was very sunny and because of that many tree shadows fell across the trail. For the shadows I mixed blue and crimson and a touch of raw umber. 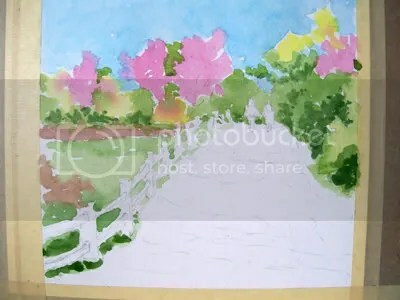 After a long winter, I was very happy to capture this spring moment in a watercolor sketch. 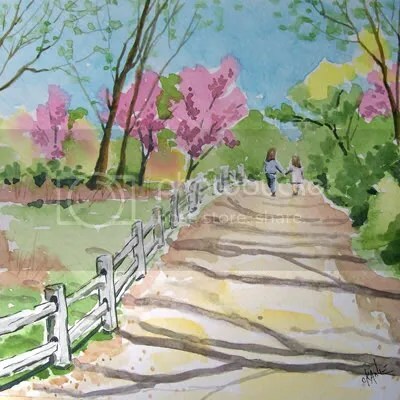 Christine, I am so glad I found your watercolor blog! This is a beautiful painting. Do you mind if I try painting it from your reference photo? That’s awesome. 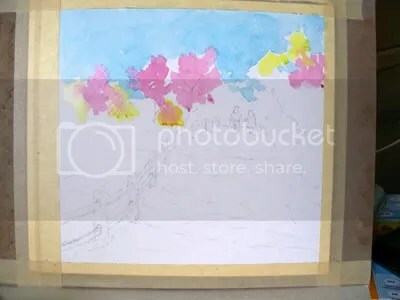 I used to draw out some details before painting, but being left-handed, I just smear it everywhere & destroy my beautiful, white canvases, so I don’t draw before I paint anymore. It makes it one HECK of a challege, I can tell you! Jen: Of course you can! You can use any step-by-step reference photo to paint from. Have fun! Lana: Yes I can imagine, I do not dare to paint without a sketch… I’m not that talented! I tried but what my brain saw and what my hand painted was two different things! Charu: You are very welcome, I hope you try this painting and remember…have fun! Lana, would sketching from the right side of the picture to the left help? That way you would keep the work on the right side and wouldn’t move your left hand back over it.